There are a few popular smokers out there. If you are looking to purchase one, here is a run-down on a few. The most common smokers are heated by charcoal/wood, electric or gas. 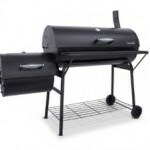 ($40+) This is usually the beginner smoker, mainly because it is inexpensive to make, produces tasty smoked meat, and is fairly portable. 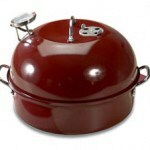 It usually involves a basket for the charcoal on the bottom and water bowl directly above. Many of these also come in electric and gas. 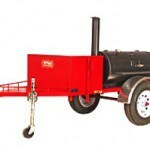 ($62+) A firebox is located to the side of the horizontal chamber and fills the barrel with smoke. You can also cook the meat in the horizontal chamber directly above the heat. “Pellets” are small, compressed wood used as fuel. 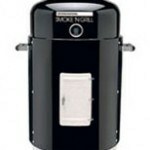 Although these smokers look similar to an offset smoker, they take on a different technique of cooking. The pellets are pushed into a burn pot with an auger that when ignited, creates enough heat to spread across a deflector plate, which then heats the smoker. These are the most expensive ones. Many people use these in competitions and other outdoor events. 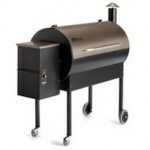 ($60+) These small, indoor smokers are nice for those who don’t want the commitment that’s involved with outdoor smoking. They use the same principle as other smokers but on a smaller scale.